$300,000 in pledges to be paid over 3 years. 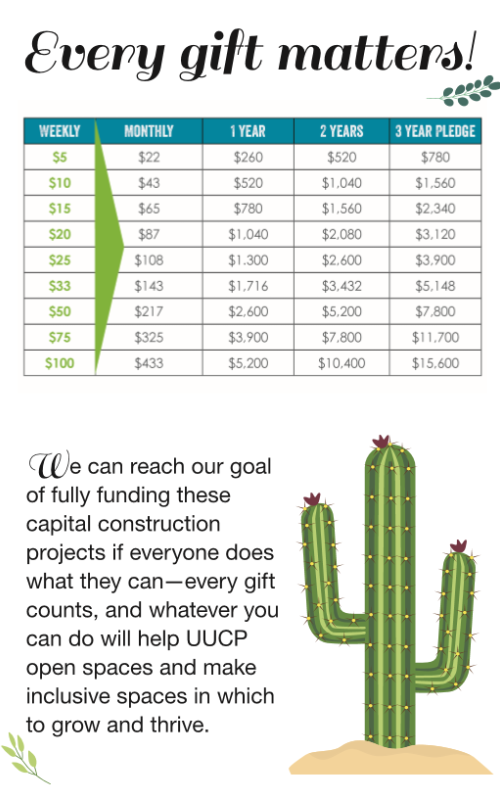 Your Capital Pledge will cover a three year period starting July 1st, 2017 and ending on June 30th, 2020. 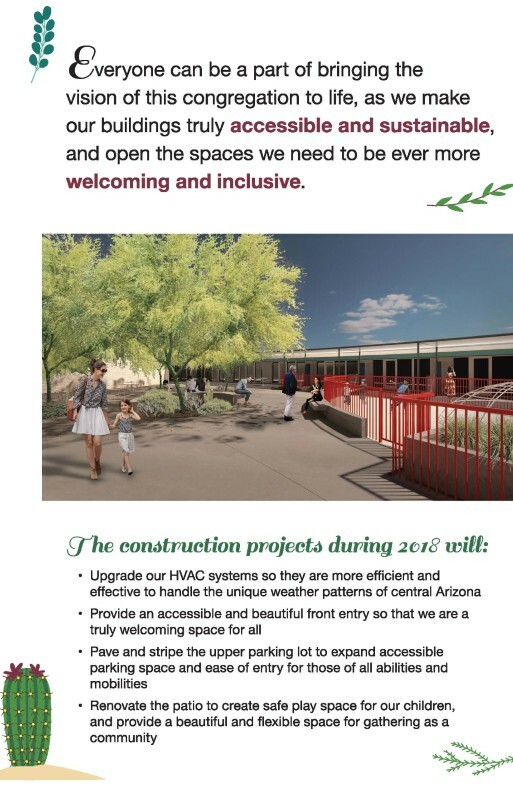 We hired a fundraising consultant and formed the committee who worked with the staff to decide what projects will be included in this new Capital Campaign. 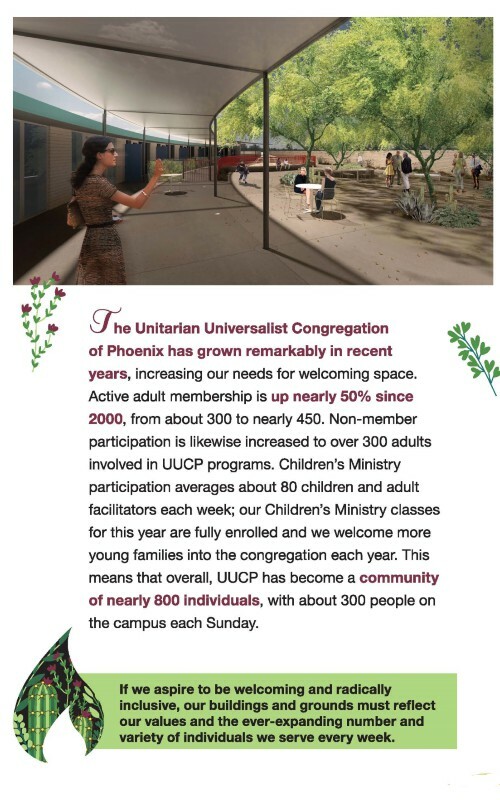 All the funds raised for the Capital Campaign support very specific projects: new Heating & AC equipment, renovations to the northwest parking, pathways and patio to increase accessibility into the main building and sanctuary, and a fund for growth to build capacity for justice and adult ministries. This third item is a fund that will provide partial support for Emrys’ position as Director of Justice and Pastoral ministries as our operating budget grows to fully fund the position over the next 5 years. There is no suggested giving guide for a Capital Campaign. Most of the money raised will come from members’ assets such as stock donations or IRA distributions. However, gifts from Members and Friends’ discretionary income will be needed as well to make the goal. For those who are working with one pot of money for which Stewardship and Capital Pledges are paid from, we ask that you maintain your current Stewardship Pledge before calculating your Capital Pledge. If your Capital Pledge is literally giving up one Starbucks a week, it counts and is greatly appreciated! There is tremendous flexibility in fulfilling a Capital Pledge – monthly, quarterly, annually, or in a lump sum, and most folks spread their payments over the three years. All that is asked on the pledge form is that you indicate your intentions so the congregation can budget the capital funds appropriately. When you make a payment on a Capital Pledge, please be sure to include “Capital Pledge” in the memo line of your check or in your stock donation letter. As you start to receive your quarterly pledge statements you’ll want to pay close attention to make sure that your gifts are being recorded appropriately to either Stewardship or Capital. Mistakes happen, but we can fix them easily enough if you let the office know. Please let me know if you have any questions, comments, or concerns about the logistics of pledging, donating, or the congregation budget. 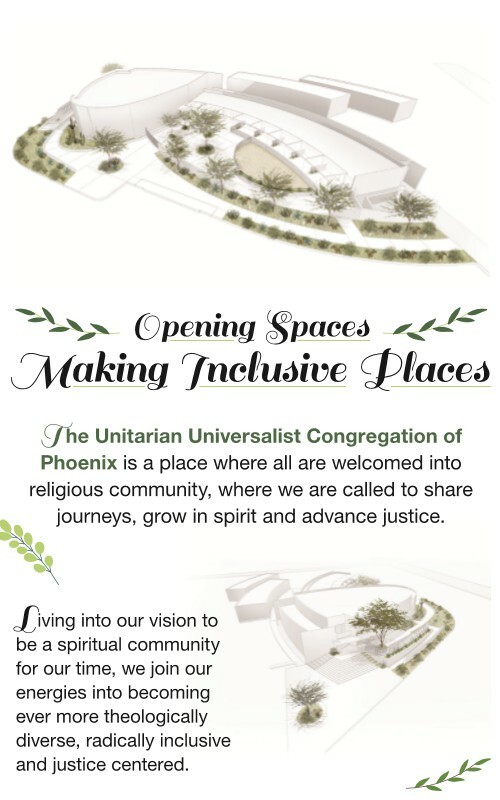 I can be reached via email at admin@phxuu.org or by calling 602-840-8400 ext. 202.